Hold onto your hat cowboy! The popular mechanical bull ride is a flashback from the 70s with an added twist. The most talked about activity anywhere. Our expert operators make this ride fun and SAFE for cowboys and cowgirls of all ages. The operator controls the speed of rotation and the level of bucking so riders of most any age can participate. 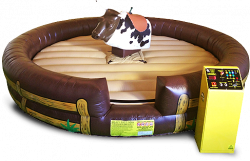 It is a perfect toy for backyard parties, schools and country club functions.